When you have hours upon hours of flying time to get home, you have lots of time to think and reflect….so I just started writing and I thought I would share my thoughts with all of you! (Can’t believe this is my last blog post!!) Sorry my thoughts may seem a bit disjointed at times… What can I say? These past 6 months have changed me in ways I never imagined. I have grown more than I expected or ever could have anticipated. God has truly blessed me through this trip. I come back learning so many things about myself, my God, and people in general, especially people of a different culture. God is everywhere. God is so good. God is bigger than I ever imagined. And he is ever present. To see Cambodians worship the same God I worship made me realize and see more clearly that God is a God of many nations, many peoples. He is not the Western God but the one true God, the creator of all. My world has grown- I have had my eyes opened and have learned many sweet lesso ns from living overseas. Living alongside a people very different from myself, with a different language, different cultural practices, different climate, and a different official religion. Intimidating? Well of course, but exciting, eye opening, exhilarating. A trust exercise? Yes definitely. When we feel like the outsider, the one that is different, the foreigner, we don’t know how people will react to us, how they will approach us. What do you do when you have those moments of doubt or uncertainty, you turn to God, you trust Him. And you remember that we have a common need, and that is the Gospel. We all need the Gospel and it binds us together, it is the common thread across cultures. And you continue to trust God and show love to those around you. God is faithful, God watches over his people, and he continually provided for me. He sprinkled little blessings throughout my days- He didn’t have to but he continually made His presence known. Especially at the beginning I felt inadequate, out of sorts, unsure of what my place would be or what my ministry would like, or if I could do what was being asked of me. God continued to remind me- take it one day at a time Becca. And my perspective changed. For instance with teaching, it no longer mattered if I had the perfect lesson prepared- what I wanted was to teach with love and joy, and to show Christ to the kids in some small way. To have fun with teaching, to smile, to laugh, and to encourage them. I was continually reminded during my time in Cambodia how blessed I am to have grown up in a Christian home with Christian parents- and to not face the persecution that many face in Cambodia for their Christian beliefs. 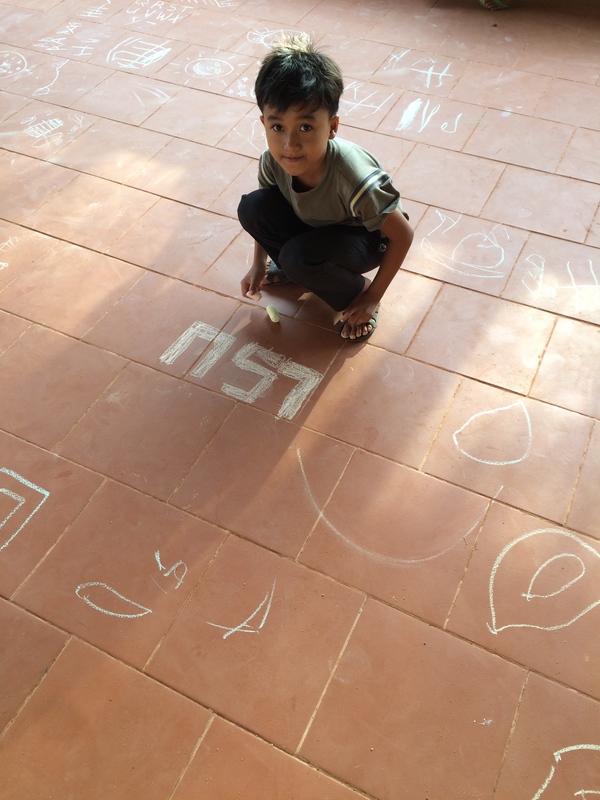 The kids I lived life with for six months face persecution of different kinds- from their family and friends, and they continue to believe, they continue to attend church, they continue to pray to the one true God. 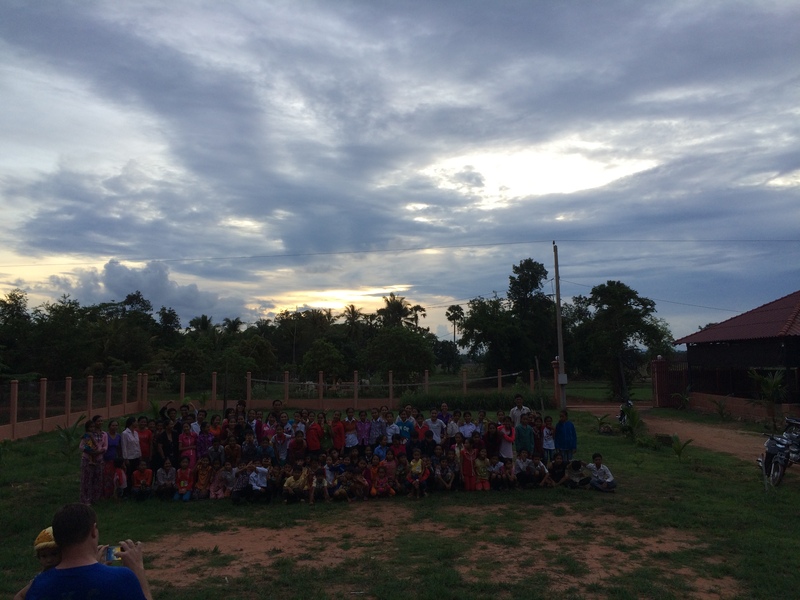 God is definitely at work in Angkjeay village- and I am so excited to hear how God works in the coming years. Using His people to share the truth of the Gospel- to show Christ’s love to those around them, to let it permeate their lives. 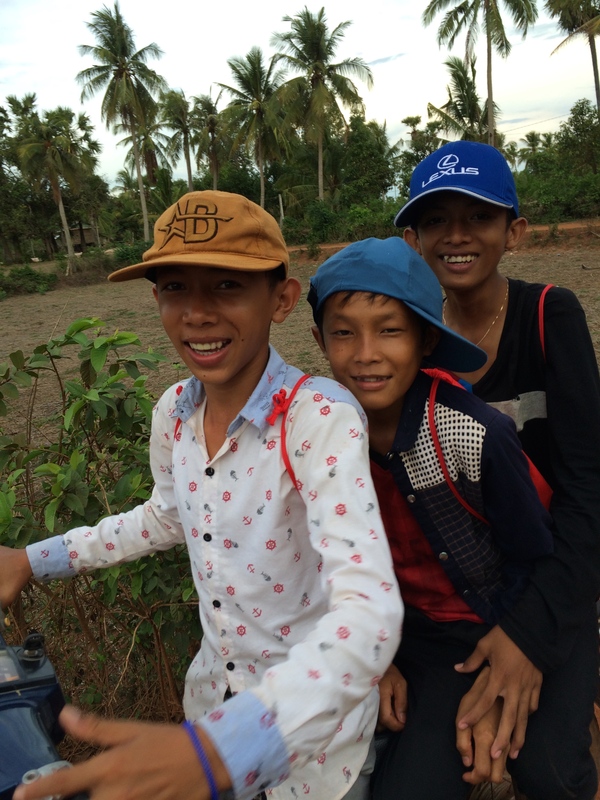 While in Cambodia God was revealed to me-through His creation, through Luke and Sokha, through the love shown to me by the kids- God is there. He is everywhere, he is in the U.S. and He is in Cambodia. Less than 3% of Cambodia is Christian, but I saw them, I met them, befriended them, lived life with them, sought to love and encourage them. I think being completely out of what was comfortable for me forced growth. It was inevitable. And it comes a lot quicker. I was faced with new obstacles and challenges every day. And God was always near to me, guiding me- I felt weak at times and I knew without God I would be hopeless. But God gives us hope, he gives us strength. Our weakness can glorify God as it shows we need Him, He is strong when we are weak, He is our rock. He always was while I was in Cambodia. I am constantly changing, growing, learning, but God is constant, He doesn’t change. I have learned I may be gifted in teaching-something I want to pursue more. I love relationships- and they are so incredibly important. Intentional relationships. I witnessed their utmost importance in the furthering of the Gospel. 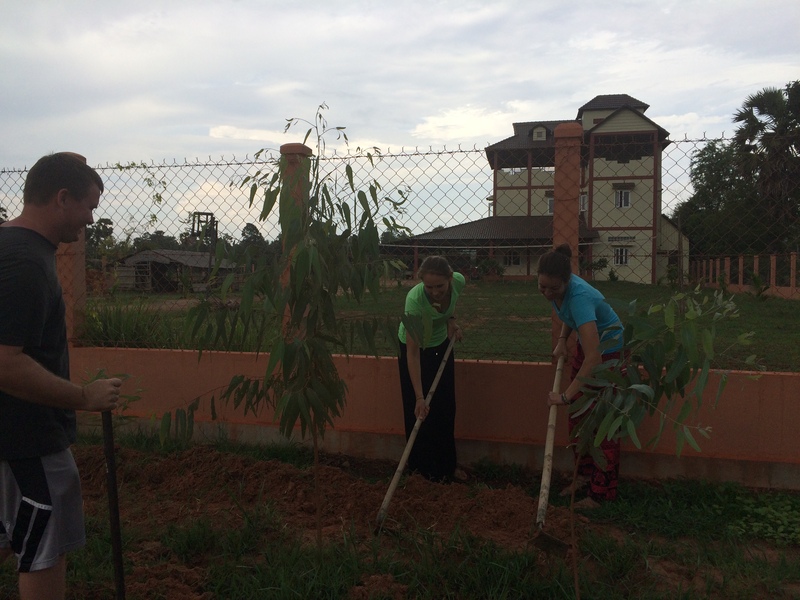 Coming alongside missionaries in support and developing relationships with Khmer Christians and non-Christians. And each relationship takes time, effort, prayer- and I desire to make this a more present part of my life. Cambodians definitely know how to say goodbye well. Lots of tears but I am so thankful for the goodbye parties I was able to have before leaving. I have never taken so many pictures, but I loved it. Although goodbyes are hard, they are so important. 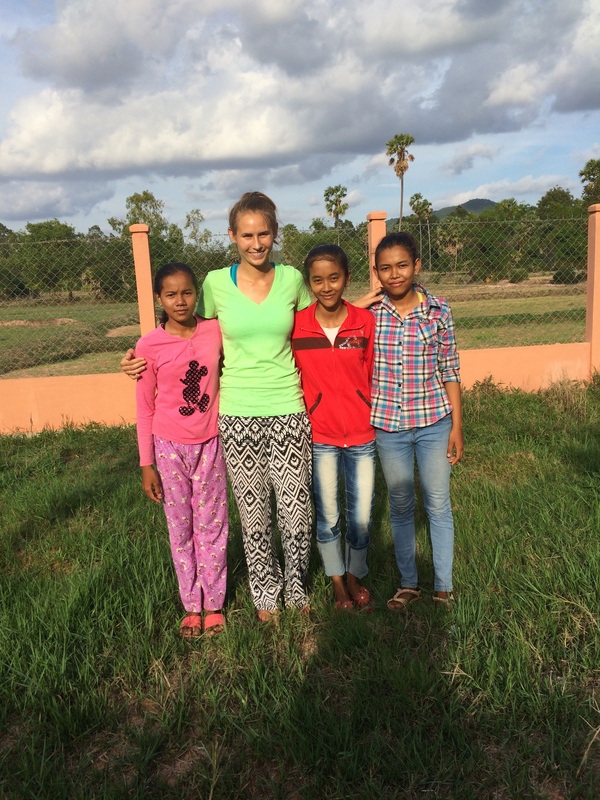 I feel so blessed to have met such an incredible group of people in the village and in the city, Khmer and expat. What an impact they have made in my life. I am so thankful I had the opportunity to live life with them for 6 months. A sincere thank you to all of my supporters. I am overwhelmed with gratefulness for the generous financial support and steadfast prayers. These past 6 months would not have been possible without your support. I kept telling people I felt the prayers from all of you. I could feel your support all the way over in Cambodia. I thank the Lord for each and every one of you! 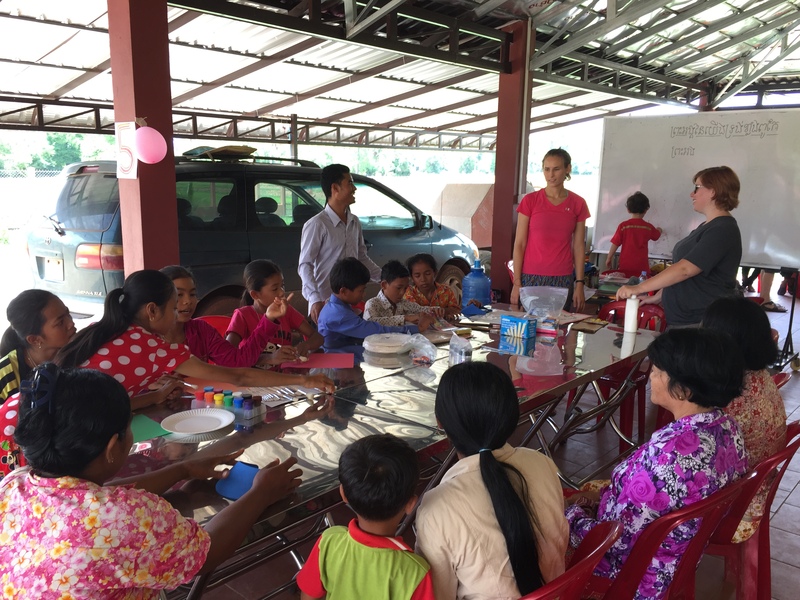 ~Strength and wisdom for Luke and Sokha as they are faced with the ups and downs of doing ministry ~For the church in Cambodia- that it would be encouraged, strengthened, and continue to grow. First off, thank you to everyone who has supported me financially and in prayers. I could not be here if not for you. It honestly means so much to me. I’ve officially been in the village of Angk’jeay for about 10 days now and am getting into the swing of things. Luke and Sokha have english classes at their house every day of the week except Sunday. On Mondays, Wednesdays and Fridays there are three english classes that go on at different times of the day. They start each class by singing a few hymns and praying. Many of the kids know how to play guitar because they have learned from Sokha, so usually a few students will play the guitar while the rest sing. It’s very beautiful to listen to and watch. Many of the students have become christians through coming to these classes over the past four years. On Tuesdays, Thursdays and Saturdays I will start teaching a english class through bible stories. We started a booklet on the life of John the Baptist and I’m excited to see where it goes. The students love to play volleyball! Luke and Sokha have a volleyball net set up in their yard so we play together quite often. They are pretty good(way better than me)!! Recently we started playing USA against Cambodia… they love representing their country, that’s for sure! We took many of the students to the mountain this past Sunday after church. 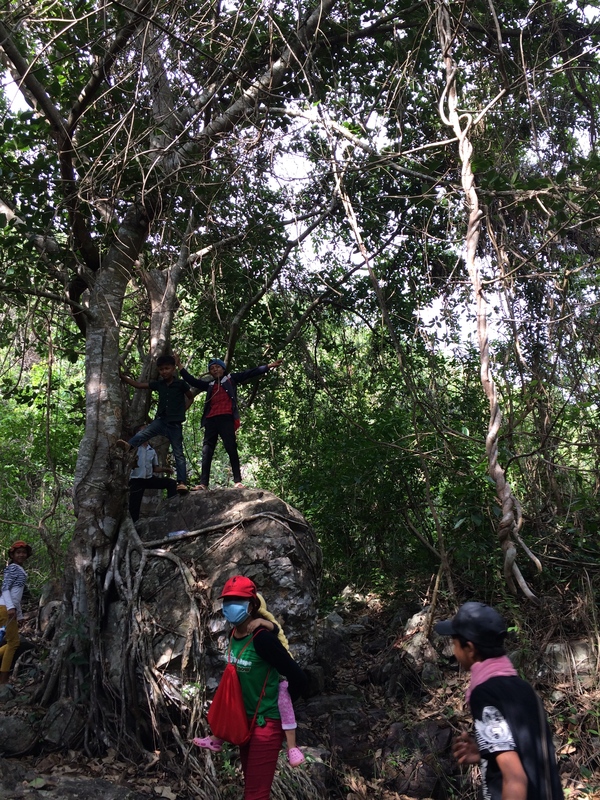 We were able to hike for a while and explore a little bit. Personally speaking, I had a lot of fun and I think all the students did too! Luke, Sokha, and Becca also hosted a health fair for the students this past weekend! 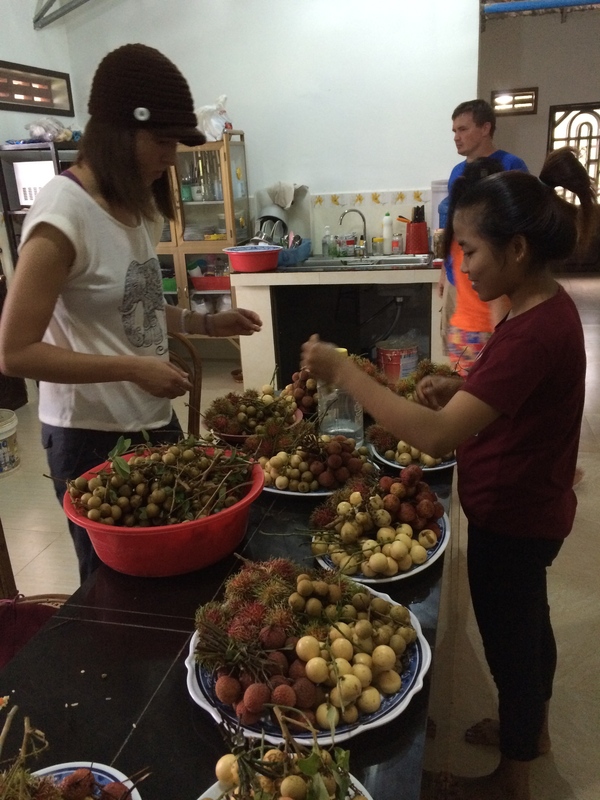 Some team members from Phnom Penh came to the village to help with the sessions. There were sessions on toothbrushing, hand washing, height and weight, and nutrition. It was a huge success and I think the kids learned a lot and had a lot of fun! We had a farewell party for Becca last night as it was her last day in the village yesterday. Becca is an intern from the states who has been here since January. Cambodians definitely know how to say goodbye well. It was incredibly beautiful and heartwarming to see everyone from the village come help send Becca off and wish her well. There were lots of tears. It’s not hard to see the impact she has made on the students’ lives while she’s been here…. or the impact that they have made on hers. It will be hard to see her leave tomorrow, though. Speaking of Becca- I cannot put into words how thankful I am that I have had her to help me transition into the village. She has been a blessing from God and we have gotten along so well! It’s been so good to learn from her and witness the love she pours out daily on the village of Angk’jeay and the people in it. She will definitely be missed. I am quickly learning that God is more amazing and comforting than I could ever imagine. I don’t deserve life but He has given it to me and all I can do is be eternally thankful. The students love taking pictures! The health fair! I was in charge of crafts. God does amazing things with the sky here. It’s a new surprise every evening. The fruit for Becca’s party! Becca’s farewell party. So many loving people came to send her off. May I just add how amazing the sky looks in this picture. We helped plant trees in the front yard the first Sunday I was there. It was great. Our trip to the mountain was fun. They loved climbing the rocks. 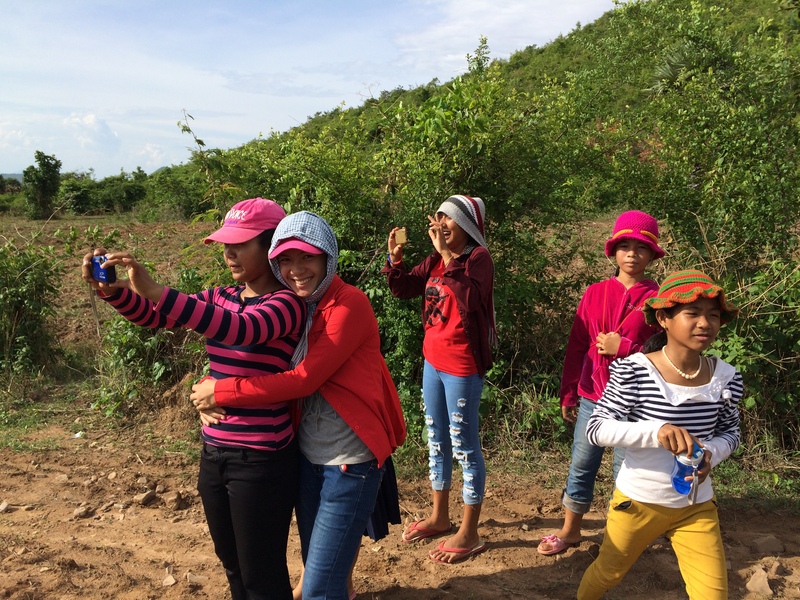 The girls taking pictures on our way to the mountain. For more students to come to know Jesus through these classes. Also for the students’ futures, that they have a chance to experience God’s immense love in many different ways. Me to be an effective teacher while I’m here and to hold nothing back. Also for me to be content while I am here and for any homesickness that may occur to leave quickly. Thank you again for praying for me, supporting me, and keeping up with me! Yesterday was my last day in the city (training) and today we head to the village of Angk’Jeay! I will shadow Becca(the other intern) and begin teaching soon. 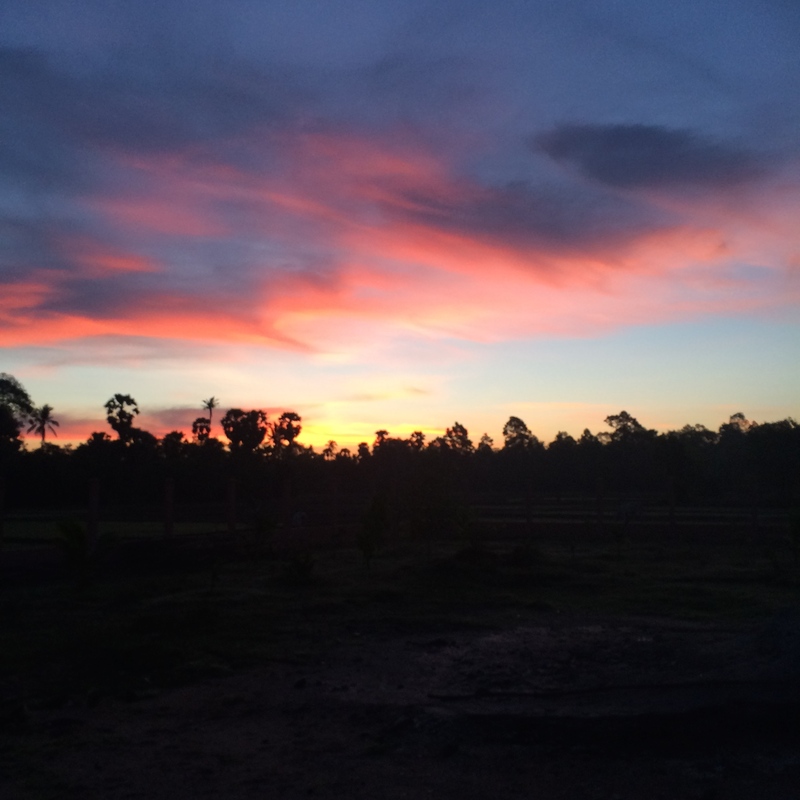 I’ve only been in Cambodia for five days but have not ceased to see God’s amazing Grace working. The team here is amazing and I could not be more blessed to be able to work with these people and learn from them for the short time that I am here. In the short time that I have been here I have learned how to teach affectively, learned some kmer language, and learned the importance of culture and what a difference it makes. Cambodia’s Culture is so beautiful. It’s delicate in some ways and very unique in others. Learning about a different culture has opened my eyes to see my own culture in different ways. Nevertheless, it’s amazing to see God work all the way across the world (literally 12 time zones away). The Beauty of all the people I’ve come in contact with gives me so much Joy and hope. Thank you for all the prayers. I sincerely appreciate them!